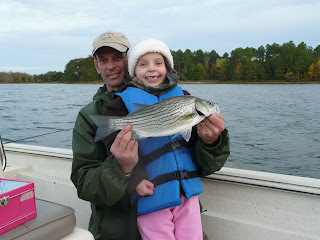 Today I went to Hartwell with my 5 yr old daughter to test our new lake boat and fish. We got a 20ft Xpress with a 115 hp fourstroke yamaha. This boat runs like a dream. With 2 large casting decks and room on the floor for a third angler this boat will make fishing so much more comfortable. It rides like a Cadillac. The post-front conditions from the last couple of days had the fishing off a little today. We had to cover a lot of ground but finally found a few schools of hybrids in the open water on the south end. Lots of chop made it hard to see the blitzes, you really had to watch the birds and keep your eyes peeled. My daughter caught her first lake hybrid- a 3 pounder on 8lb test. What a great fight on light tackle, she was so excited.